Former Ohio State cornerback Malcolm Jenkins remembers the thrill of being the 14th overall pick in the 2009 NFL draft. But seven years since, and a day after the 2016 first round that saw five Buckeyes taken, Jenkins was gaining satisfaction of a different sort. 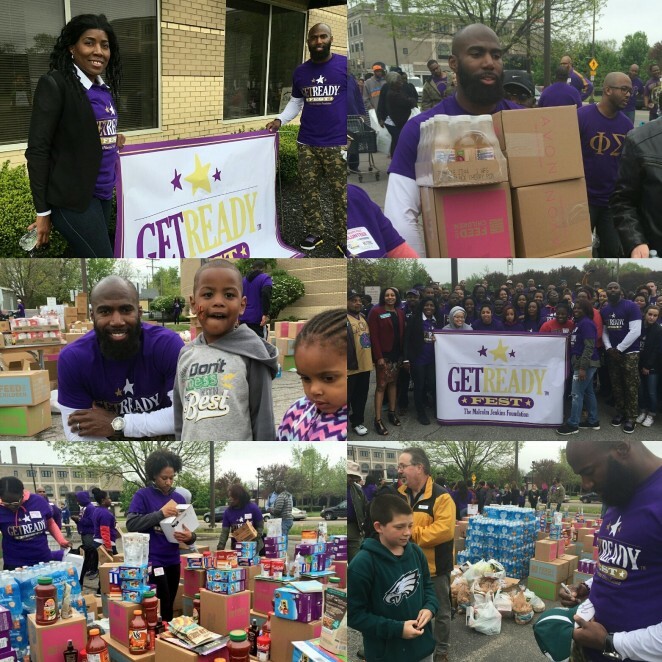 This morning he was at the Columbus Urban League parking lot off Mount Vernon Avenue helping coordinate the second Get Ready Fest, a collaboration of his Malcolm Jenkins Foundation, Feed the Children and Teleperformance. With its mission to distribute a 25-pound box of food and a 10-pound box of personal hygiene products to 1,200 pre-identified families who can use the help, the orderly line stretched down the block. “We’re feeding and helping over 4,500 people,” Jenkins said. “They get not only the food, but they get resources, they get haircuts, help services — everything that they need to really get a kick start. Ironically, it was his being drafted in 2009 that helped set him on this path. He was taken by the New Orleans Saints, thrusting him into a city still in the early years of its recovery from the devastation wrought by Hurricane Katrina in 2005. “Seven years ago I was getting drafted to a city that had a lot of need,” Jenkins said. “I got to look around the community and could see there were people that needed help. So I did what little part that I could. That list includes New Orleans; his hometown area in and around Piscataway, N.J.,; Philadelphia, where he now plays for the Eagles; and Columbus, where he was a star for the Buckeyes. The program is in its fourth year overall. Asked whether he’d recommend becoming involved in such endeavors to those drafted on Thursday night, Jenkins said, “I think it’s all personal, and it all depends on what you want to invest your money in. His friend and former New Orleans teammate Will Smith, who played at Ohio State before him, had been involved in several chartitable endeavors during his playing days and since his career ended after the 2013 season. But Smith, 34, was shot to death on a New Orleans street several weeks ago after a late-night traffic accident escalated into a confrontation with the driver who had hit him from behind. “Unfortunately I don’t know what the lesson is from this tragedy beside the fact life is short and you’ve got to enjoy the time you have with your friends and family,” Jenkins said. “It’s a tragic situation, and it brings to light to a bigger narrative about violence and some senseless acts. Jenkins, meanwhile, is an NFL veteran and Pro Bowl performer who has persevered for two teams during the past seven years, so he had some advice for those being drafted this week. “One, enjoy the ride,” he said. “There’s a lot of things, a lot of pressure, a lot of tugging and pulling — everything is really set up for you to fail, basically. But you’ve got to enjoy it. And then, just be smart. Have a plan, because football is very, very short.